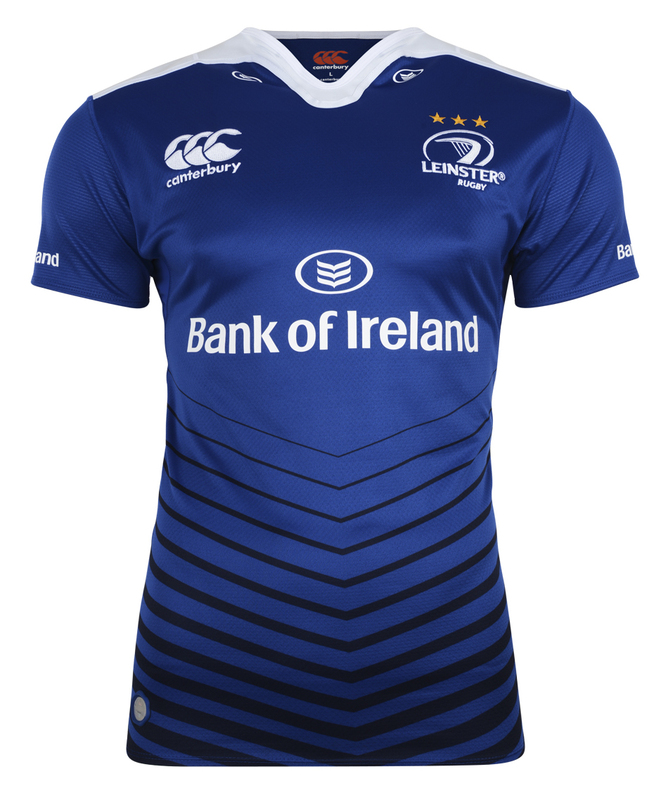 The shirts Leinster have been wearing for the last few seasons were very nice – a textbook Canterbury fusion of clean design and some modern flourishes, and on the face of this, the new shirt takes a similar approach with equally successful results. While last season’s shirts were generally very well liked, though there were a few who felt that there wasn’t enough white involved, and even a few grumbles that the shade of royal blue used wasn’t quite right… people are a bit weird about this stuff, what can you say? Hopefully then, they’ll be a little more pleased with this year’s effort, as that blue definitely feels a bit more traditional and deep than the ever-so-slightly washed out tone of the previous design (though lighting and all sorts can play a part in this sort of thing, so judge for yourself when you see one in the flesh), and white is most certainly back on the agenda. Yes, as has been the way with some of the other Canterbury shirts we’ve seen this season, the new 360° Loop neckline is a contrasting colour to the rest of the shirt. We’ve seen it work and we’ve seen it, well, not… but this is probably the best of the bunch. 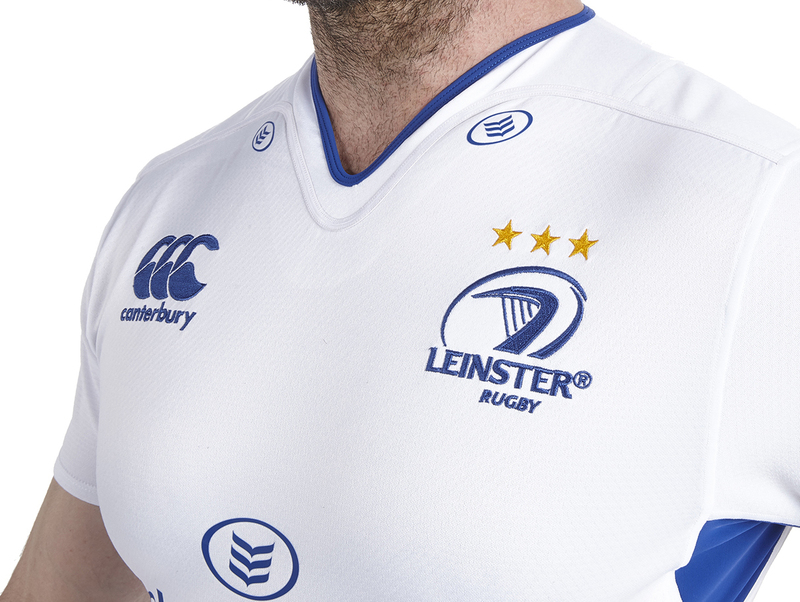 The striking contrast between the white and the blue here is striking, but not clashing, and the way it extends across the shoulders really brings the white back into the Leinster colour palette, and kinda gives the shirt a bit of a retro vibe, we really like it. The white neckline might be the most eye-grabbing feature of the top half of the new shirt, but Canterbury has saved the most noteworthy feature of the design for the bottom. Running from just below the chest sponsor are a series of 12 black chevrons that get progressively thicker as they go down the shirt. Has Canterbury just gone chevron crazy this year? Well, no, not quite. 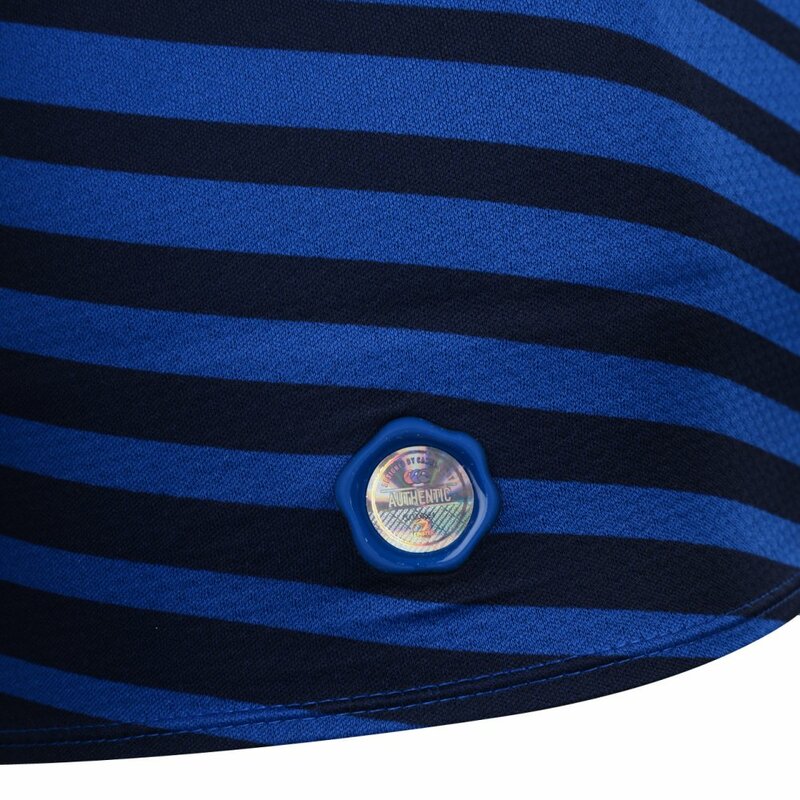 You may remember that last season’s shirt had four stripes running across the shirt, each made up of three smaller stripes. You may not have known, however, that those stripes were supposed to represent the 12 counties of Leinster, and here the idea has been replicated, but on a much more overt scale. You could also argue that the rough shape of the chevrons is kinda similar to the harp on the club crest, but let’s not labour that particular point. 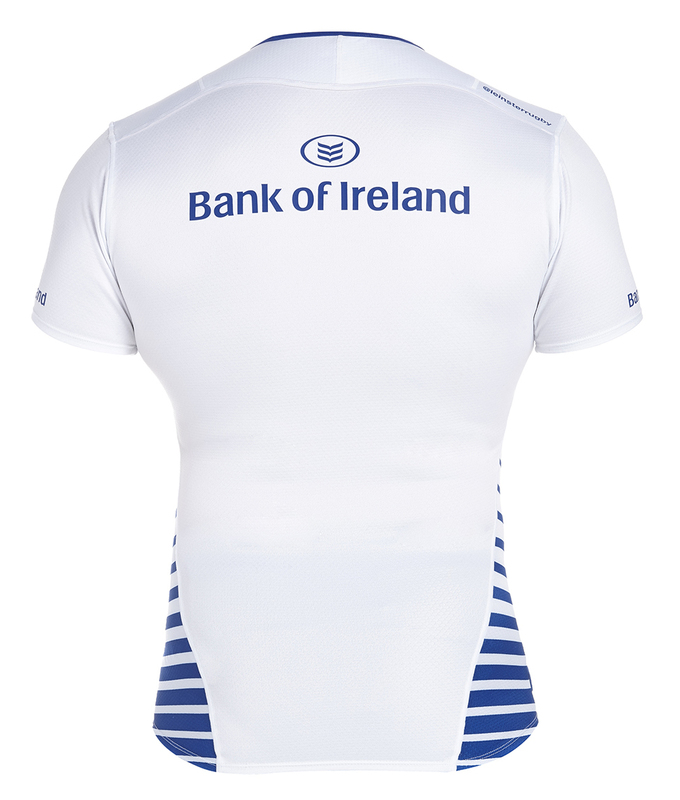 The alternate shirt takes the usual Leinster format of mixing white with royal blue in the same basic design, and once again, it’s turned out a shirt that’s perhaps even better looking than the home. The 12 chevrons are much more overt here, and make this feel a touch more modern than the home design. It’s not a straight Ctrl+Shift+Swap Blue For White design, however, as the Canterbury designers have opted to not make the Loop neckline a contrasting colour here, and instead leave it white, with just a hint of blue piping around the neck to break up the line of the top of the shirt. It definitely makes the top of the shirt feel cleaner than on the home, but they both work in their own way, we think. As you can probably tell, we really like these new designs, but there was one aspect of this design that we’re really disappointed about, and that’s to do with the club crest. Rather than stitch the badges on in traditional style, this year’s England, Ireland and Bath shirts did something very different. Instead, the badges were created using a 3D injection-moulding technique. The results were unique and so damn cool up close, we were really hoping that it would become standard among Canterbury’s top echelon pro teams. Sadly, however, this shirt has the trusty, hard-wearing but significantly less cool traditional stitched design, and while it looks totally fine and everything, we can’t help but pine for the space-age excitement of the 3D injection-moulded badges. We’re not sure whether money, time or technology has stopped Canterbury from rolling it out across their range, but we hope in the future years this disappointment will be rectified. Canterbury has rarely put a foot wrong in recent years, and these shirts epitomise the way the brand’s designers are comfortable mixing the modern with the vintage in a way that could easily create a bit of a dog’s dinner. 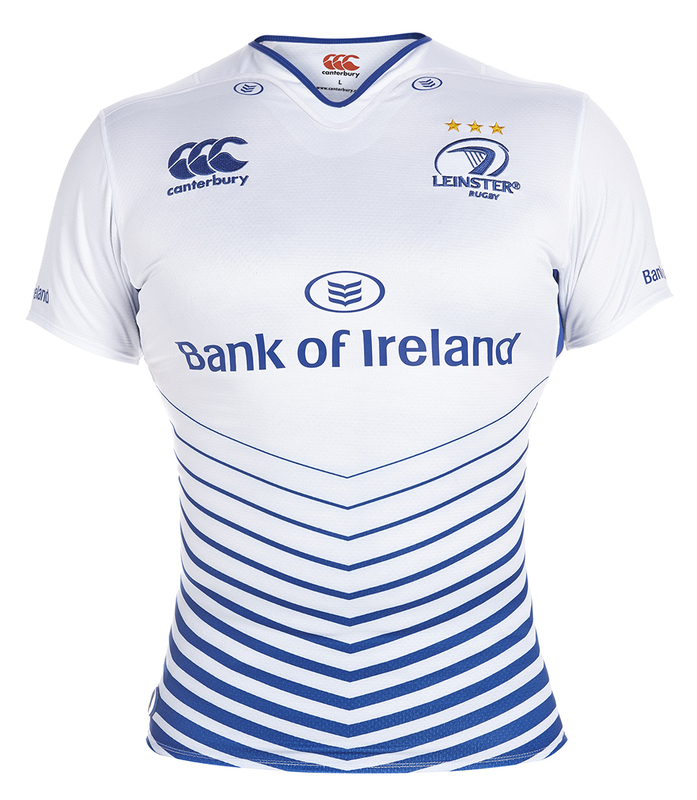 Instead, Leinster have two shirts that are similar, yet different, and both look gorgeous in different ways. 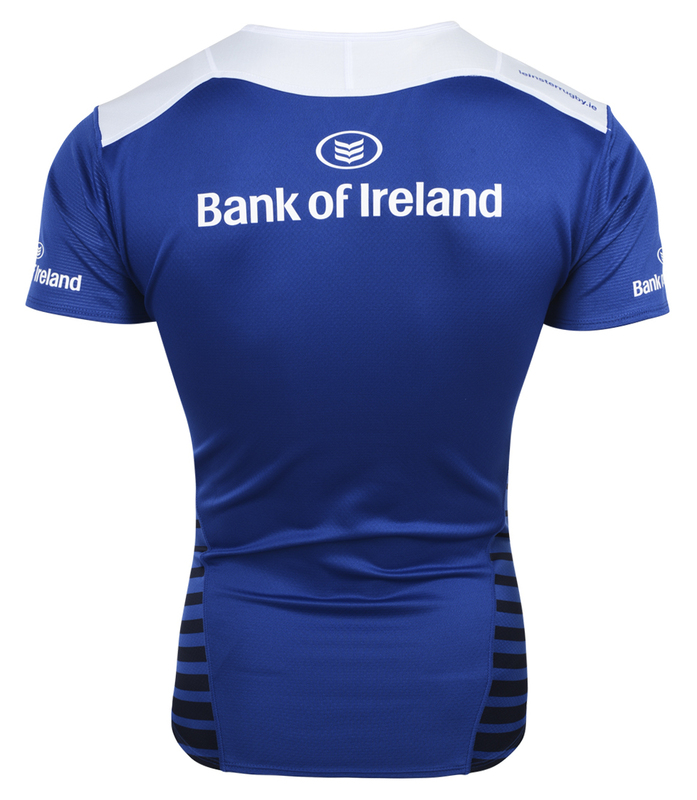 Time will tell if these new shirts will bring Leinster back to the heights of domestic and European success to which fans have become accustomed in recent years, but there’s no doubt that they’ll be spending the next two seasons in some lovely jerseys. Shame about the lack of 3D badge though!